I stared in wide eyed wonder at the clean cut modern surroundings. From the outside the building looked just as plain as any other building on that same street. But once inside, it was a totally different story. The woman continued her tour of the place, taking me to the 2nd and 3rd floor and showing me all the classrooms and facilities for students. 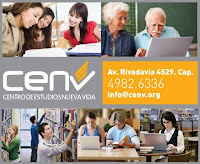 I mentioned to her that what a blessing it must be to have found such a beautiful location for their college, Centro Estudios Nueva Vida in the middle of Buenos Aires. She then stated the fact that alot of buildings and facilities that belonged to the government were state of the art and modern but to get a location like the one they had privately owned, it was very rare indeed. After a brief tour we sat down for a meeting to discuss bringing the language of English to Centro. She took out the books they had been using and showed it to me and let me know their course was quite basic. I then told her a little bit about my background, how I learned two languages successfully and was also able to teach deliver private lessons in english with fantastic results. I also then pointed out to her that I felt in the coming years, english would be a necessity for the church branch on Centro at 683 Florida ave, in Buenos Aires. Buenos Aires is the busiest city in all of Argentina and Florida ave, where the church was located is the busiest street in all of Buenos Aires. This church branch has got more access to tourist, visitors, and foreigners that speak english than any of the other branches in Argentina. They want to reach out and touch the world but at this point, their love does not translate to those who do not speak the language of spanish. At one point in my journey here, I began to foresee that this my be a problem. What also was a problem at that moment is that there was very little interest in learning english. This is understandable. For a majority of these people, their whole lives are conducted in the language of spanish. Up until now, there is no reason for them to take the time and trouble to learn this language. They are completely unaware of the necessity of the english language or how important it will be in the years to come. One of the hardest things you can ever do is motivate someone to learn another language. It takes time, commitment. It is alot of fun but can be very intense. To date, I am only aware of two people who are actually truly passionate about wanting to take on the task of learning another language. But the rewards of knowing a second language are endless. Job opportunities, travelling, making friends. Learning spanish was one of the best investments I made into my life. With one language, I have access to more than 22 countries as well as 330 million people who's first language is spanish. And it is the exact same for english. I pointed out during our meeting that we need to make people realize that learning english would not just help them reach tourist and foreigners who pass by the way of the church, it would change their life if they knew this language. They would possibly be able to get higher paying jobs and better positions. Travelling would be less of a hassle without the language barrier. In short, they would be unstoppable! But in the meantime, she did see another way that I could help them. She mentioned to me that they have a course in biblical english where they teach english vocabulary associated with biblical studies. She said it would be great if I could give a talk and teach some vocabulary as well as teach a little bit about the culture of the first world. This was another area that became quite clear that they needed assistance in. As we chatted, I informed her that it would be important for the people in church to understand a little bit of the culture of the first world nations. Because some of their seemingly innocent actions that are a normal part of life here could easily be misinterpreted by a foreigner. I gave her an example. Here in Argentina it is OK for people to stand out on the street and try to hand flyers out promoting their restaurants, or their church, or their business. I let her know that that type of conduct is looked down upon in the first world. In general, looks, appearances and reputation are very important so people do not do things like that. And the people who normally do things like that are viewed upon as maybe being in a cult, or homeless, or simply don't have a "real" life. And I don't want people to get the wrong idea of the people at Centro. They are doing what is normal and right for this culture. And if they didn't want to extend their love to other cultures, it wouldn't matter. But they do, in fact she told me that Centro Cristiano Nueva Vida might want to send missionaries to first world nations one day. If this were to happen, it would be very important for them to see the differences in the culture between Argentina and the country they would be going to.